French architecture studio Moatti- Rivière is renovating one of the world's most iconic landmarks, the Eiffel Tower. The project, which began in 2012 and is slated for completion later this year, aims to turn the previously bland first floor into an entertaining sensory and learning experience. Along with its new contemporary makeover, the first floor of the aging icon will also be updated with many new sustainable features such as solar, hydraulic and wind power. The $34.6 million dollar project includes demolition and reconstruction of the first floor Eiffel and Ferrié pavilions, which house the welcoming center, shops and a restaurant. Upon completion, the principal reception area in front of the elevators will be renovated and expanded along with the addition of new conference rooms, a 200 seat multipurpose theater, a visitor center and an open air Museographic path that leads around the first floor. 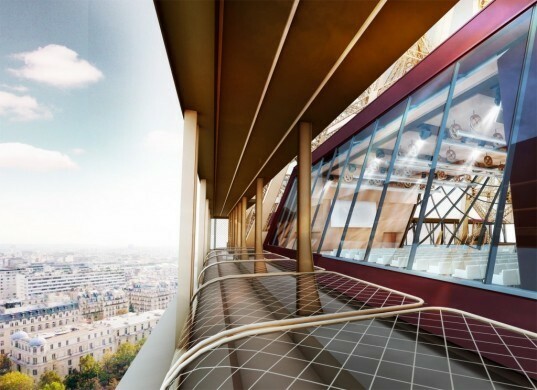 Glass flooring and balustrades will be installed for optimal viewing from 57 meters above the ground. Equally important to the renovation project is the new accessibility options that will finally allow disabled visitors to visit the first floor. To help improve the tower’s energy efficiency and reduce its fairly large carbon footprint, the first floor pavilion will be equipped with solar panels and LED lighting. Four windmills with vertical axes will power a turbine for drinking water and a runoff system will be used for rainwater collection. The $34.6 million dollar project includes demolition and reconstruction of the first floor Eiffel and Ferrié pavilions, which house the welcoming center, shops and a restaurant. Upon completion, the principal reception area in front of the elevators will be renovated and expanded along with the addition of new conference rooms, a 200 seat multipurpose theater, a visitor center and an open air Museographic path that leads around the first floor. An open air viewing platform with glass flooring and balustrades will be installed for optimal viewing from 57 meters above the ground. Equally important to the renovation project is the new accessibility options that will finally allow disabled visitors to visit the first floor. To help improve the tower’s energy efficiency and reduce its fairly large carbon footprint, the first floor pavilion will be equipped with solar panels and LED lighting. Four windmills with vertical axes will power a turbine for drinking water and a runoff system will be used for rainwater collection. The Eiffel Tower renovation started in 2012 and is slated for completion in August, 2014. The sustainable features of the renovation project include solar, hydraulic and wind energy.